A guy brought these over today to get measured. He found them in ‘05 and decided to do something with them. He can’t decide if he wants to leave them as sheds or have a mount done with them. I did ask him if I could post this. It has a broken brow tine on right side and an extra point on left. As it lays now with a guestimated inside spread it grosses 182 and nets 169. If he didn’t have a busted brow, 187-5 gross and 180 net. The G2’s were 14-1 and 15-2. Absolute monster. What do you think he should do? Mount them or leave as sheds? He should give them to me!!!!!! Sell them I bet to the right buyer they would fetch $1000. 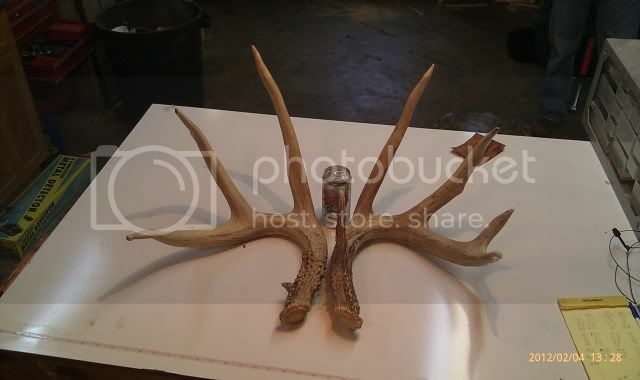 A cousin of mine had an antler buyer stop buy his place in brown county said he was really looking for big typical matched pairs and said $1000 was easy money on anything over 160”, I wasn’t there but I believe him. The buyer sold sheds to collectors and artists. I reckon it’s a matter of personal inclination. I’d leve them as sheds and run a piece of leather around the bases and hang as such. Leave as sheds for sure. Lots of character and you can tell the story that he and is sons and grandsons rome that stretchnofnwoods to this day. And btw- I love the Coors Light can as a reference for size! I would not have thought much of the sheds without that! Im with Oz, Leave as sheds!!!! !